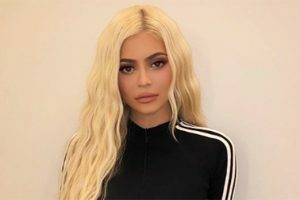 Celeb hairstylist Chris Appleton is revealing the exact steps and products used to give Kylie Jenner her brand new Barbie blonde hair — get his top tips below! Kylie Jenner, 21, is a hair color chameleon and now, she’s rocking yellow blonde hair. Stylist Chris Appleton showed off her new look on Instagram on Nov. 6 and is explaining to HollywoodLife.com exactly what he did and how YOU can get the look. “To get this golden blonde color, I mixed Lime Crime Unicorn Hair Tint in Tweet ($16) with Lime Crime Unicorn Hair Mixer in Dilute. I love to use Lime Crime’s Unicorn Hair to tone Kylie’s hair. The formula has no chemicals, so it made her hair look beautiful and feel like silk. Not to mention, gold blonde is making a comeback. It’s great fun and such a pretty color.” Get Kylie’s look in 3 easy steps below. “1. Section hair into 4 even sections (front to back and side to side) and secure with clips. Work in 1-inch wide strands. Apply color evenly from root to tip with applicator brush. Begin at the root of the hair, applying color evenly through to the ends. Massage each strand with fingers, root to tip to ensure even distribution of color. 2. Leave tints in for 45 minutes. No heat/cap required. Unicorn Hair will not damage your hair as it does not contain any harsh chemicals or bleach.